The World Bank responded to the food price crisis of early 2008 through the Global Food Crisis Response Program (GFRP), which mixed fast-track funding from the International Bank for Reconstruction and Development and International Development Association with trust fund grants to help clients address the immediate food crisis, while encouraging agricultural policies that will increase resilience in the future. GFRP resources financed operations amounting to over US$1.6 billion that reached 66 million vulnerable people in 49 countries, mostly in Africa. 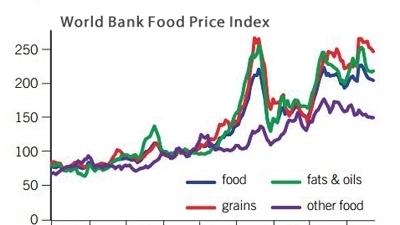 In mid-2008, the world experienced large spikes in key global food prices. The World Bank Food Price Index rose by 60 percent in the course of just a few months of 2008, and international prices of maize, rice, and wheat increased by 70 percent, 180 percent, and 120 percent, respectively, compared to the mid-2007. These price spikes were unexpected, and the impact on developing countries was large. They were estimated by the World Bank to have kept or pushed 105 million people into poverty in low-income countries. After 2008, world food prices spiked twice. In early 2011, the Bank Food Price Index, after declining by 30 percent from mid-2008 to mid-2010, rose sharply, reaching its 2008 peak again in February 2011. Then, in mid-2012, world food prices escalated again. The Bank Food Price Index rose 14 percent from January to August 2012 as world maize prices soared to an all-time high in July 2012, surpassing their 2008 and 2011 peaks and rising 45 percent within a month. These latter price spikes also had adverse impacts on developing countries, but overall the impact was smaller than in 2008, largely because many developing countries had increased their cereal production since 2008, had reduced their import bills, and fuel and fertilizer prices were at lower levels than in 2008. Countries also reacted more swiftly. The 2011 food price spike was estimated to have affected 40-44 million people in low- and middle- income countries. Broad agricultural price increases sustained overtime pinpoint to structural weaknesses in the global food supply system. Higher global food prices and food price volatility have become a longer-term phenomenon, as indicated in the Spring 2011 Development Committee Report, Joint International Organizations Report to G20, and the World Bank’s 2012 Global Monitoring Report. Price spikes and volatility are likely to continue for the foreseeable future, with persistent uncertainty on the supply side, including continued low grain stock levels, against projected rising demand and the inherent low responsiveness of the global food system to shocks. This long-term phenomenon requires a longer-term response. An era of food crises reminiscent of the 1960s and 1970s seemed to return in 2008, prompting clients to request fast-disbursing financial support and urgent policy advice to help them cope with the food price crisis without creating further problems for the future. This led the World Bank to create the Global Food Crisis Response Program (GFRP). The GFRP gave countries alternatives to the food emergency response policies of 1970s, many of which involved closing borders, government intervention in food and input markets, and other actions that had the effect of discouraging both smallholder and broader market-led investment in agriculture for many years. In 2008, GFRP’s immediate efforts included boosting social protection, bolstering affected countries’ fiscal space, and maintaining short- and medium-term food production, with grant resources targeted to the poorest and most vulnerable countries. As time passed, country needs shifted to making social protection and food production systems more resilient to variable circumstances, and the nature of GFRP grants evolved to meet these demands. Drawing upon expertise across the Bank, the GFRP financed stand-alone technical assistance, development policy lending, and investment operations under four components: food price policy and market stabilization; social protection actions to ensure food access and minimize the nutritional impact of the crisis on the poor and vulnerable; enhancement of domestic food production and marketing response; and implementation support, communications, and monitoring and evaluation. The GFRP encompassed several funding sources, with an authorized ceiling on the use of Bank sourced-funds of US$1.2 billion in May 2008, later increased to US$2 billion in April 2009. Funding sources included a single-donor trust fund (the Food Price Crisis Response Trust Fund) of US$200 million from the IBRD surplus account, a further US$1.8 billion in headroom for fast-tracked loans from existing IDA and IBRD resources already available to countries, and several externally-funded trust funds supporting the full range of activities available under the GFRP. The World Bank Food Price Index, 2000-2012, weighs export prices of a variety of food commodities around the world in nominal U.S. dollar prices, 2005=100. Global Food Crisis Response Program resources have benefited 65.9 million people in 49 countries. Of those resources, Bank-funded support to the GFRP benefited 57.3 million people, including support for social protection programs estimated to have reached 13.9 million people and support for short- and medium-term agricultural interventions estimated to have reached 8.7 million farm households. Development policy operations have supported country wide policies in 13 countries. GFRP operations funded through the external trust funds are estimated to have benefitted another 8.6 million people. Kyrgyz Republic: In the Kyrgyz Republic, 147 food crop Community Seed Funds (CSF) were mobilized through GFRP funding, benefiting over 6,000 farmers. A comparison of yield of farmers who are members of CSFs with those who are not and with national average yields from the National Statistics Committee showed impressive benefits from CSF membership in 2011. Yield differences for wheat and potatoes of 47 to 62 percent for members compared to non-members were a result of improved seed, fertilizer application, and basic agronomic training, which was also provided under the program. Nicaragua: The project in Nicaragua provided school lunches to 609,000 pre-school and primary school children. Although not all impacts can be attributed to the project, achievements include: an increase in retention rates in public primary schools in targeted areas from 84.8 percent in 2008 to 98.6 percent in 2010, and an increase in attendance rates in public primary schools in targeted areas from 78.8 percent in 2008 to 83 percent in 2009 and 80.8 percent in 2010. Yemen: 98 community-based labor-intensive works were implemented in eight governorates, providing temporary jobs to 36,000 individuals in 2009. The majority of beneficiary households used the funds to maintain their food consumption, cushioning targeted communities from the food price shocks. Sierra Leone: Tariff reductions in five key commodities in 2008 provided an estimated US$7 million in food cost savings to consumers. These lower tariffs were maintained throughout the project period with the GFRP grant compensating the government for some of the revenue losses. In addition, the provision of four priority public services continued, benefiting 24,800 people. Among the IBRD countries, in the Philippines, the government temporarily lifted the 40 percent tariff on private rice imports, allowing for larger private sector import quotas and promoting bilateral deals with Vietnam and Thailand. These policy decisions, together with the accelerated releases of rice stocks, reduced domestic retail rice prices by 13 percent between June and October 2008. In addition, the budget support also helped increase the 2008 government budget and off-budget allocation for social assistance programs and helped scale up a conditional cash transfer program to 333,000 household beneficiaries. 14,663 farmers benefited from agriculture tools. Around the world, people facing rising food prices in the crisis of 2008 cut back on food and nutrition. As of March 2013, Bank resources have financed 56 operations in 35 countries. Of the total approved operations, 58 percent of funds had been allocated to Africa as of October 2012, 18 percent to South Asia, 17 percent to East Asia and Pacific, 3.4 percent to Latin America and Caribbean, 2.1 percent to Europe and Central Asia, and 2 percent to Middle East and North Africa. Forty-four percent of funds focused on agriculture supply response, 34 percent have been development policy operations that have supported government policies and institutional actions to address the food crisis, 20 percent of funds focused on social protection actions, and 2 percent on project management, monitoring and evaluation activities and communications support. The Bank has engaged in policy dialogue with more than 40 countries to assist them to address the food crisis. In addition to World Bank resources, grant funding has been made available through three externally-funded trust funds in support of the full range of activities available under the GFRP: a multi-donor trust fund has received contributions of AUD 50 million from the Australian Government, €80 million from the Government of Spain, 11.46 billion Korean won from the Republic of Korea, CAD 30 million from the Government of Canada, and US$150,000 from the International Finance Corporation; a Russia Food Price Crisis Rapid Response Trust Fund received a US$15 million contribution from the Russian Federation for the Kyrgyz Republic and Tajikistan, and the European Union has contributed €112 million to support operations in 10 countries. Effective partnerships have led to successful implementation of GFRP operations and enhanced institutional capacity in many developing countries. The World Bank is working in 11 countries with United Nations agencies including the World Food Programme, the United Nations Children’s Fund, the International Fund for Agricultural Development, and the Food and Agriculture Organization to implement GFRP operations. Civil society organizations have been strongly involved in designing, monitoring, and implementing at least 20 GFRP projects in 18 countries. The Bank is also actively engaged with the United Nations High-Level Task Force on the Global Food Security Crisis, providing financial support through the World Bank's Development Grant Facility and participating in the updating of the UN’s Comprehensive Framework for Action. The GFRP expedited processing facility expired on June 30, 2012, implying that new Bank-financed projects can no longer be processed under the expedited processing procedures of the GFRP. Global food price volatility has become a longer-term phenomenon requiring concerted actions beyond the GFRP. Presently, the Bank has new instruments to respond to future emergencies, with some of them building on the GFRP experience. New instruments, such as the IDA Crisis Response Window and Immediate Response Mechanism and IBRD’s Exposure Management Framework will allow the Bank to respond quickly should emergencies arise. With respect to the GFRP, the Bank will focus on implementation of the ongoing GFRP-financed projects. The Bank has been incorporating lessons learned from the GFRP into the World Bank Group Agricultural Action Plan FY13-15, which commits to maintaining scaled-up lending of between US$7 billion and US$9 billion annually, including a focus on “Reducing Risk and Vulnerability” to help clients prepare and respond to future emergencies. The Bank will continue to strengthen global programs and partnerships, including mobilizing additional resources for the public sector window of the Global Agriculture and Food Security Program (GAFSP), and it will continue to play a key role in the international arena on food security matters, including through international forums such as the UN High-Level Task Force on Food and Nutrition Security, the UN Committee on Food Security, the G8, and the G20.